We just hit 1311.71 on what looks like an A-B-C corrective wave, very close to the 1312 back test target discussed at 9:40 below (which, upon closer inspection, should top out around 1313.8) We’ve also tagged the 15-min RSI TL, meaning we should turn back soon if this bounce is going to be limited to a back test. We’re sitting at the 10-period MA on the 60-min chart, and the 50-period MA on the 15-min chart — both of which should help contain any further upside. 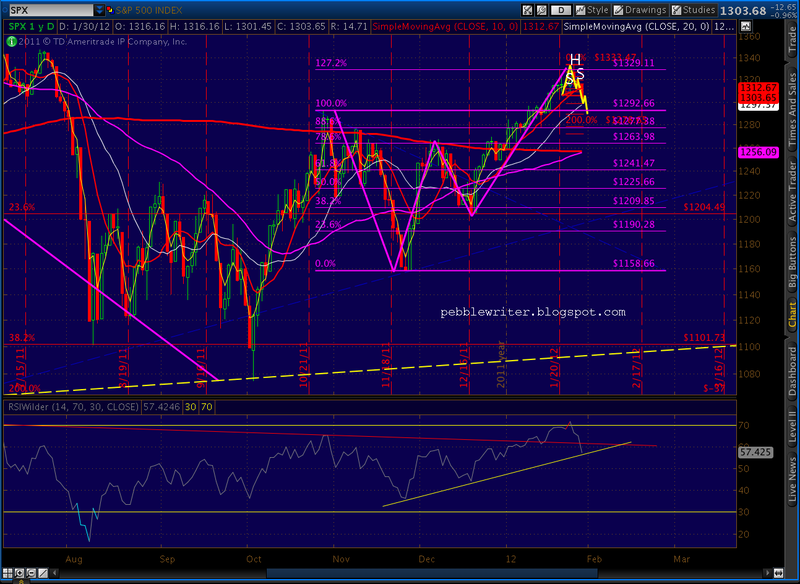 The 10 day SMA on the daily chart is just above at 1313.37. The market bounced at 1300, one of the three levels we were watching, and is currently back testing the neckline of the little H&S; pattern that started everything (see first post below.) 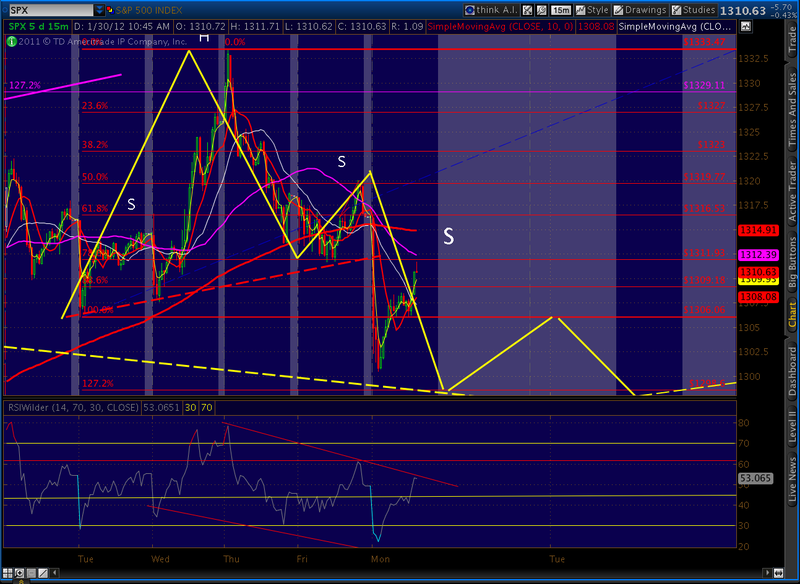 The RSI TL is also being backtested, and should provide a clue as to when the back test will fizzle. If the neckline holds, the next H&S; pattern to play out should be tilted the other way — that is, the right shoulder will be lower than the left. 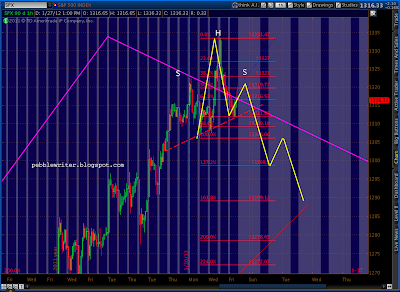 Interestingly, the neckline of this pattern would complete right around the TL discussed in my last update. 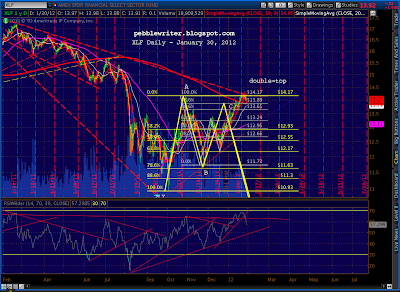 The ability of the market to push through this TL would manifest in a strong decline. In fact, the target of the new H&S; pattern is currently around 1264 — the .786 Fib level of the 1158 to 1333 move and the level of horizontal resistance from Dec 7 and Dec 27. Nice clean break of the 60-min RSI TL. 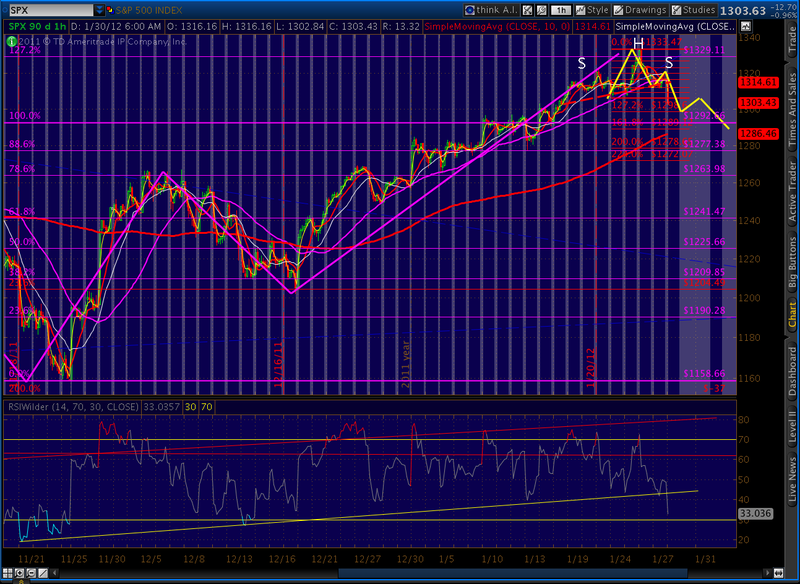 For this decline to really take off, we’ll want to see a break of the TL on the daily RSI. 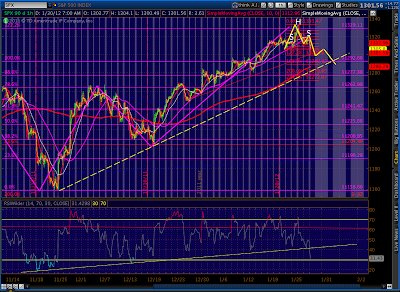 Note the proximity of the 50 and 200 SMAs. 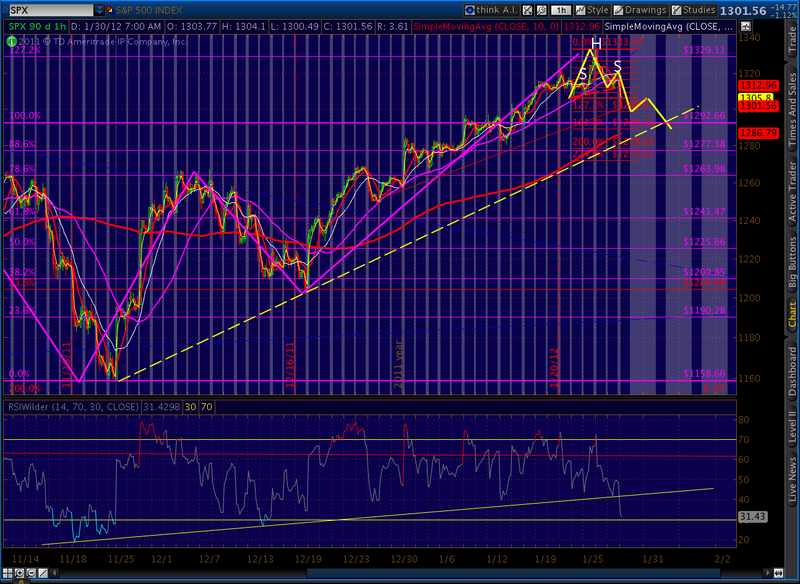 The only thing that could keep the 50 from peeking (and peaking) above the 200 would be a very sharp correction. If this decline sticks, it’ll be the first time we’ve closed below the SMA 10 since December 19. The SMA 20 waits for us at 1297.30, very close to the 1.272 extension at 1298.60 — two of the three primary reasons I’ve drawn in a bounce at 1298. The third is that 1300 should produce a “round number” bounce and, depending on the timing of the decline, might intersect with resistance from a couple of TL’s on the price chart. We discussed this last week… it would be quite normal to see a pause at the yellow dashed TL that has investors scratching their heads, wondering whether this is a significant downturn or simply the fleshing out of a channel. The bounce, wherever it comes, will likely take the form of a back test of the H&S; neckline (red, dashed) — which means it could go as high as 1312 or so. It would give bears another opportunity to add some shorts for the next leg down. Place stops accordingly. Financials face a similar test. 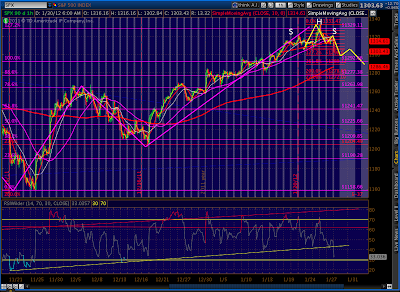 XLF, which has spent nearly two weeks above its SMA 200, broke its 60-min RSI TL and the price channel it’s been in. 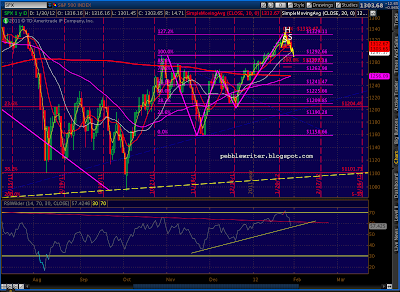 The real test will be to break back beneath the 200 and to break the daily RSI TL. 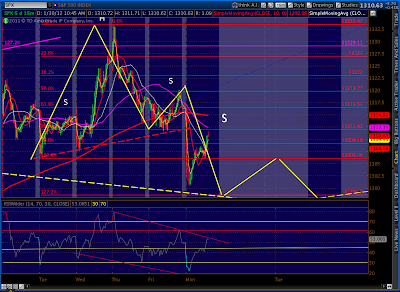 This is a continuation of several posts last week in which I suggest 1333 was the Wave 2 completion. Taking into account negative divergence on most time frames, excessive bullishness, poor breadth, etc., I believe 1333 was at least at an important turning point. Almost every indicator I watch is calling for a significant downturn just ahead. A quick glance at the past few days confirms there’s a clear path lower. 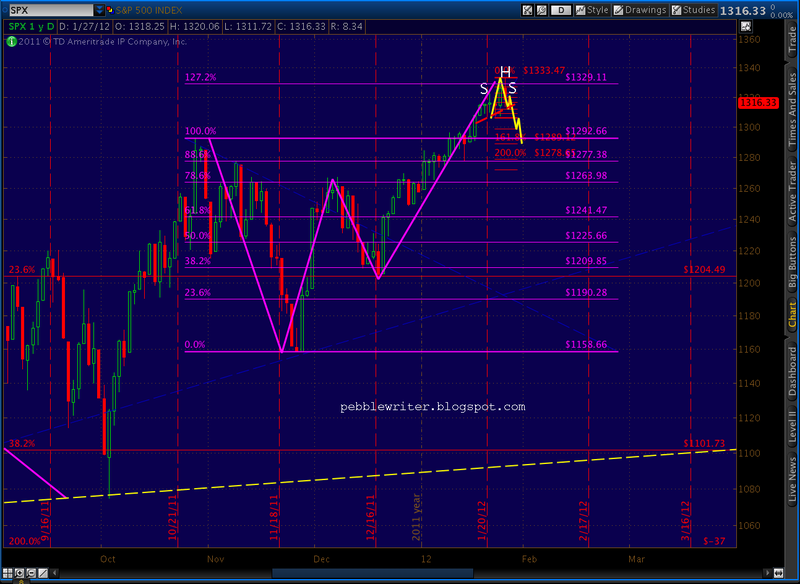 Recall that we just completed a Butterfly pattern (and Bat) that call for a sharp decline. 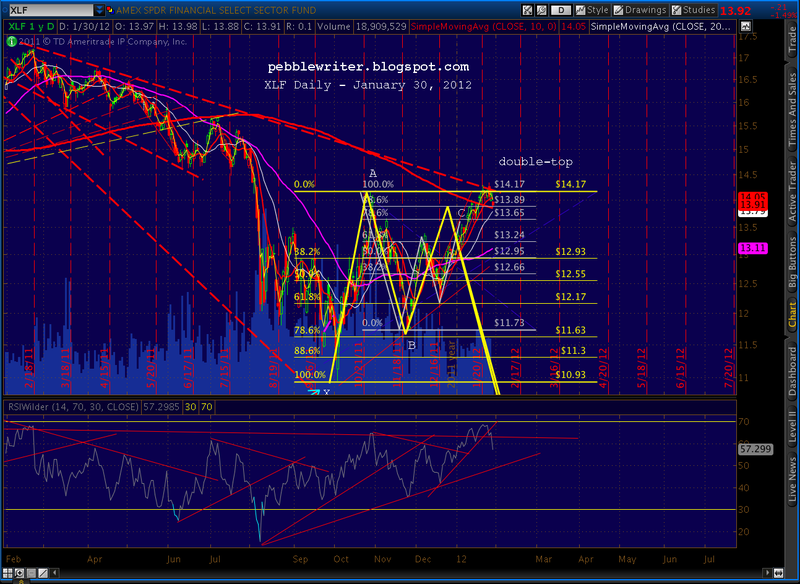 As we discussed over the weekend, the pattern targets 1010 or 1050. The question arises as to how we get there. 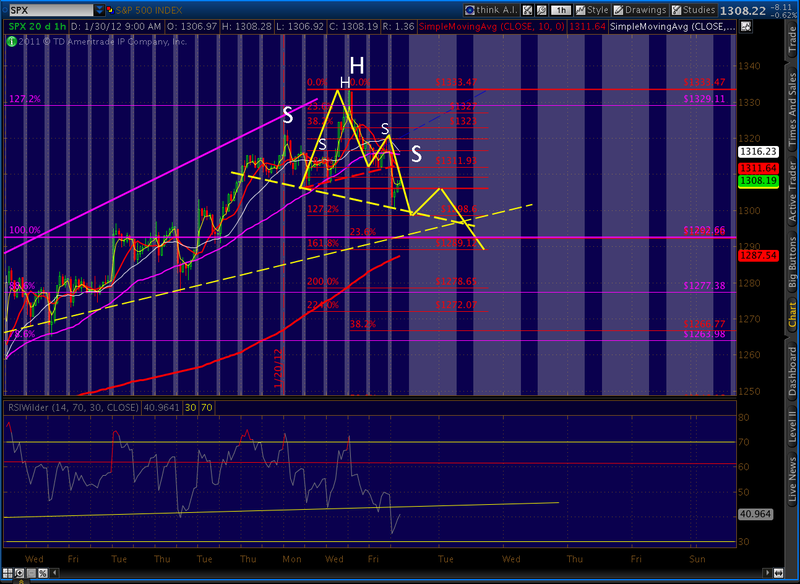 We need one slightly lower price move in order to complete the H&S; pattern we’re tracing out. And, the fact that Friday’s low came at .786 of the 1306 – 1333 move tells me we might be working on a Butterfly pattern. These typically complete at the 1.272 or 1.618 extension (1298 and 1289, respectively) — which is pretty cool as the H&S; pattern completes at 1288. 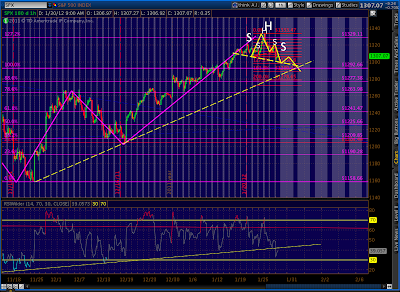 As mentioned earlier, we have a decent shot at some cascading H&S; patterns playing out on the downside. It wouldn’t take much to build some momentum. Thankfully, the speaker usually means the word “figuratively” or “practically.” Here’s a promo that popped up on the newswires this morning. I’ll leave it to my astute readers to decide whether or not the Renaissance Orlando Resort just announced a Valentine’s weekend special for cannibals. Meanwhile, the Euro-mess continues to display strains between the haves and the have nots. Please by no means feel under appreciated, your analysis is greatly appreciated. It is my own inability to understand some of the technical language and implication that have caused your misunderstanding. I sincerely apologize. I guess I still have a lot to learn from your great blog. Thank you so much for your effort and replies. Good stuff, PW. Thank you. No worries, I overreacted. 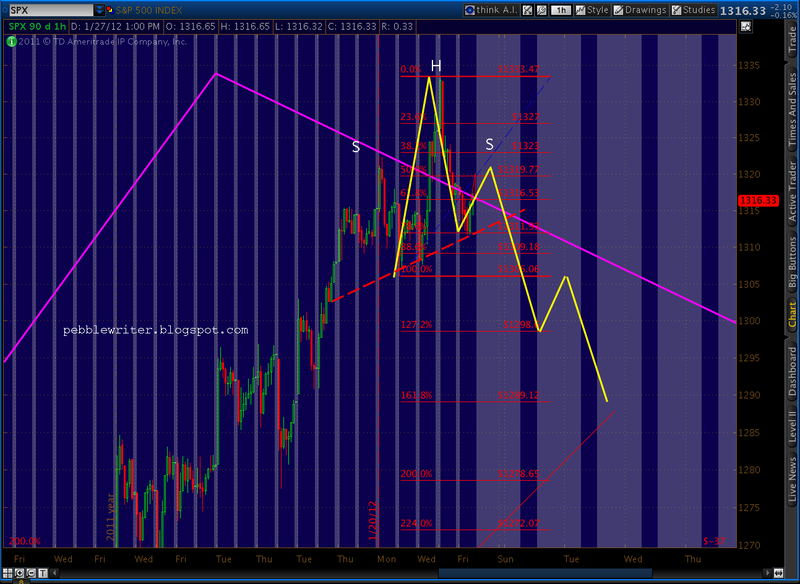 There just aren't that many days for us technicians where we nail it within 50 cents on either end of a 15-pt swing. Kinda like a triple double, or bowling a 280. I was still in the "basking phase" of my afternoon when I read your comment and felt a little under-appreciated. I agree with you completely. Discount its accuracy all you want, but it's still an indication that something's wrong with the recovery story. If things are so hunky dory, why do we need ZIRP for two more years? Been involved in several discussions the last few days RE the BDI and it's relevance as a indicator of economic activity and as such a indicator of future market direction. Many are saying that the BDI is a poor indicator as it does not correlate well to economic activity due to the fact that it focuses on dry bulk goods only and a declining index likely has a great deal to do with new ship availibilty. My argument is that given that the BDI has plummeted over 50% since the begining of Jan(down another 3.31% today), that this is outside of the norm. 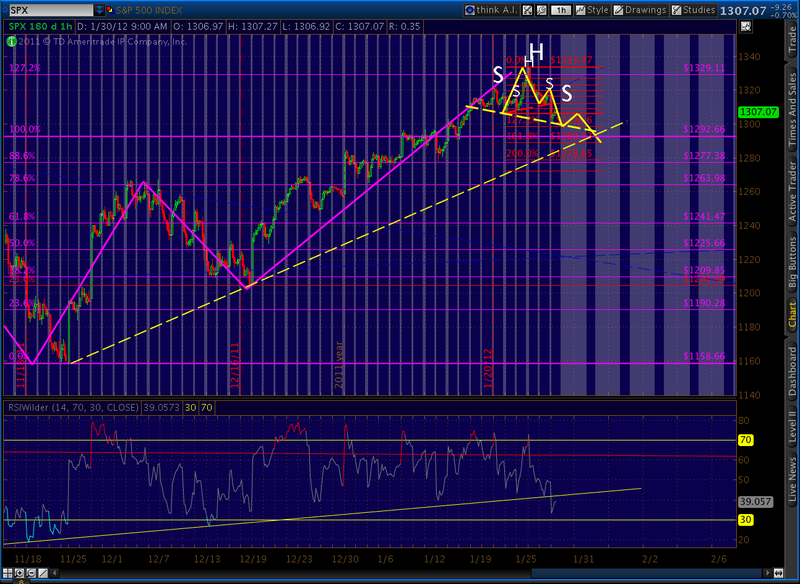 I will buy the fact that an oversupply of shipping would put a downward bias on the NDX, but 50%+ in less than 4 weeks! Now take have a look at the HARPEX, this tracks container vessel rates. And you guessed it……PLUMMETING also. Something is definitely not right. 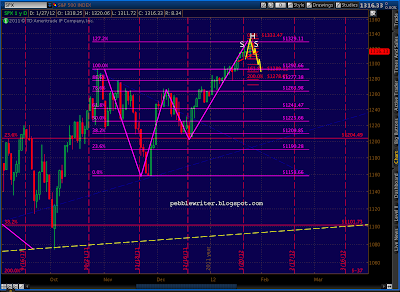 WHY did the Fed make moves last weeks?